One of the leading Malls in the Tampa Bay area. The Shops at Wiregrass Mall has it all. Mall hours: Mon - Sat: 10am - 9pm & Sun: 12pm - 6pm ***Restaurant hours may vary. 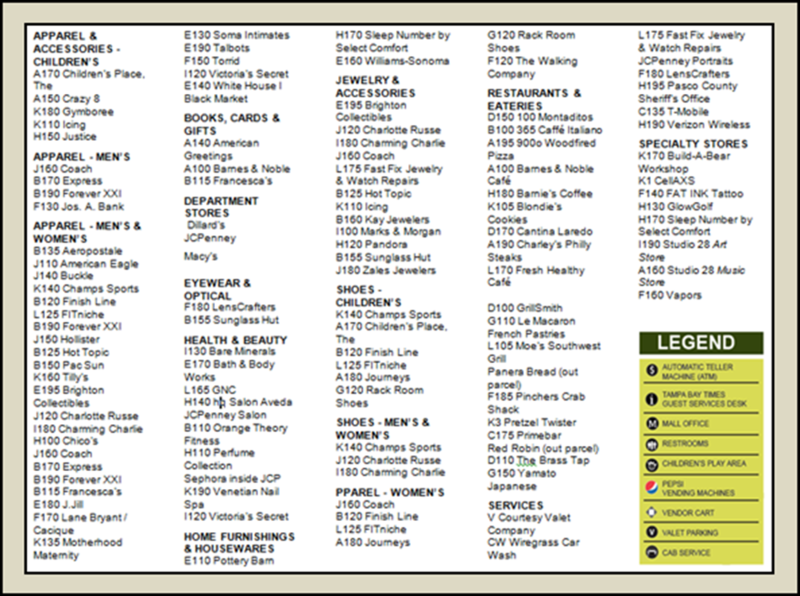 Check out the map to locate your favorite store. 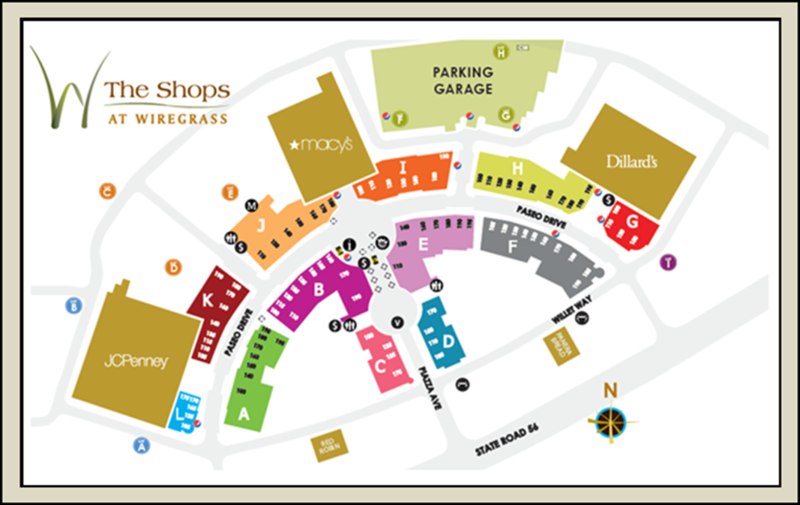 Enjoy shopping at The Shops at Wiregrass Mall. Macy’s, J C Penny and Dillard’s are anchor stores. Always festive any time of the year. Now open in Pasco and Hillsborough County the new Tampa Premium Outlets opens at the Cypress Creed Town Center. This is just the start of the overall complex that will take another 7 years to complete. Nothing gets shopaholics’ juices flowing like the prospect of a new mall. Premier Outlet Malls at Cypress Creek Town Center is under construction and heading for an opening date by pumpkin-carving season in 2015. Mall developer, Simon Property Group, is building the shopping mecca at I-75 and State Road 56 interchange. 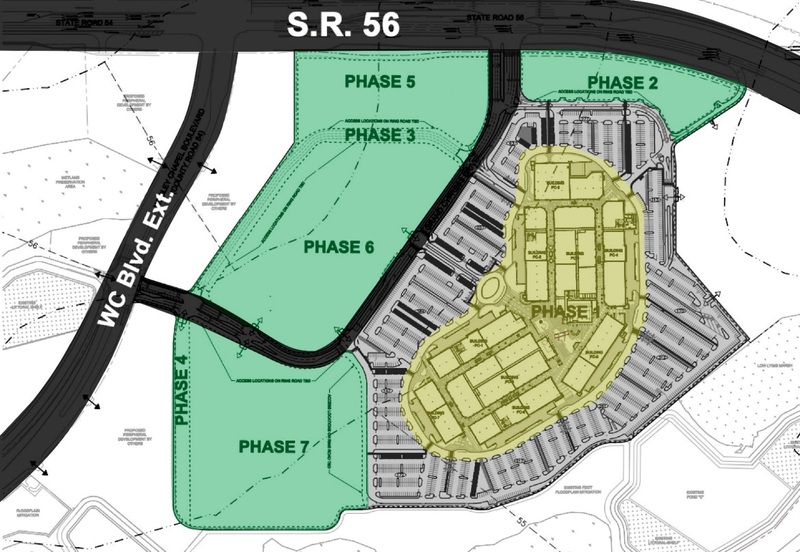 The developers are planning to build the property in seven phases, the first one engulfing the largest chunk of the 57 acres off Wesley Chapel Boulevard and State Road 56. It’s on the western-most portion of the property. The outlet mall’s announced anchor is Saks “Off 5th” outlet shop. As many as 110 retailers are anticipated. The mall will also be anchored by Kohl's, Sports Authority, and Staples. The lifestyle center will be anchored by AMC Theatres, Books-A-Million, Circuit City, and several restaurants. Many consider this type a "boutique mall". Cypress Creek Town Center will be the closest mall to Lutz and Land O Lakes only 3 miles from 54/41. 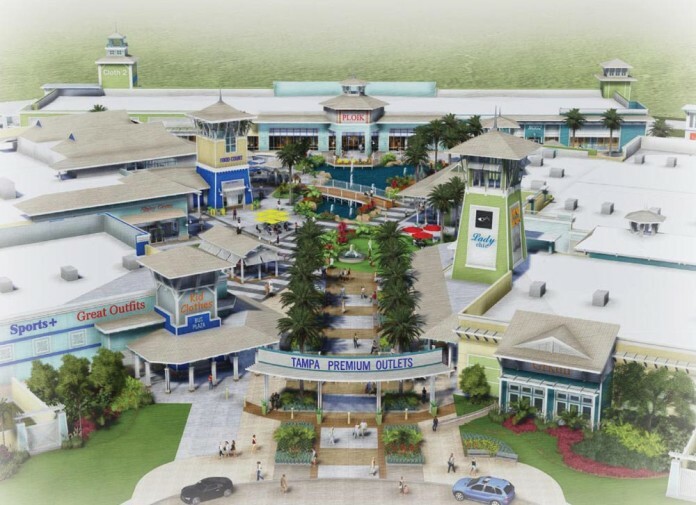 The approximately 440,000 square-foot mall will be contemporary and “Key West” in design with Palm trees and a fountain, according to a company news release. Ohio based developer Richard E. Jacobs Group is planning to open a Costco membership warehouse at the Town Center. The Cleveland-based Jacobs Group is one of three entities developing the town center project. 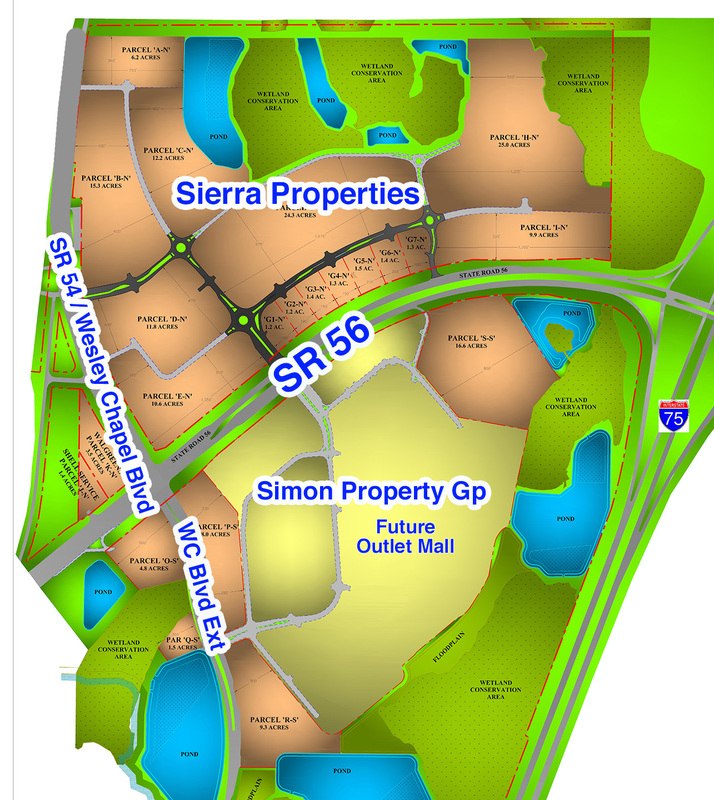 Simon is building the outlet mall and phase 1 is now open and Sierra Properties of Tampa, the original developer, owns the remaining 240 acres traversed by SR 56. Simon's marketing effort points out that the location near the highway interchange puts the project within a 30-mile drive of nearly 2.7 million people with an average household income of $64,000. Costco Wholesale plans to join the membership warehouse market in the New Tampa/Wesley Chapel area with a 153,000-square-foot store at the Cypress Creek Town Center. It becomes one of the latest retailers to be confirmed for the 540-acre town center which includes the 1.1 million-square-foot Tampa Premium Outlets mall as its centerpiece. This is the growing list of restaurants: BJ’s Restaurant, Brewhouse, the Panda Express, Chick-fil-A, Cheddar’s Casual Café and Culver’s. These restaurants are joining a growing list of retailers that have filed plans with Pasco County as part of the town center. When completed, the more than 500 acre development project is scheduled to contain 2 million square feet of retail space, restaurants, offices, hotels and a residential community and a movie theater. The outlet mall alone will be comprised of nine buildings with 482,000 square feet of retail, and nearly 2,400 parking spaces.